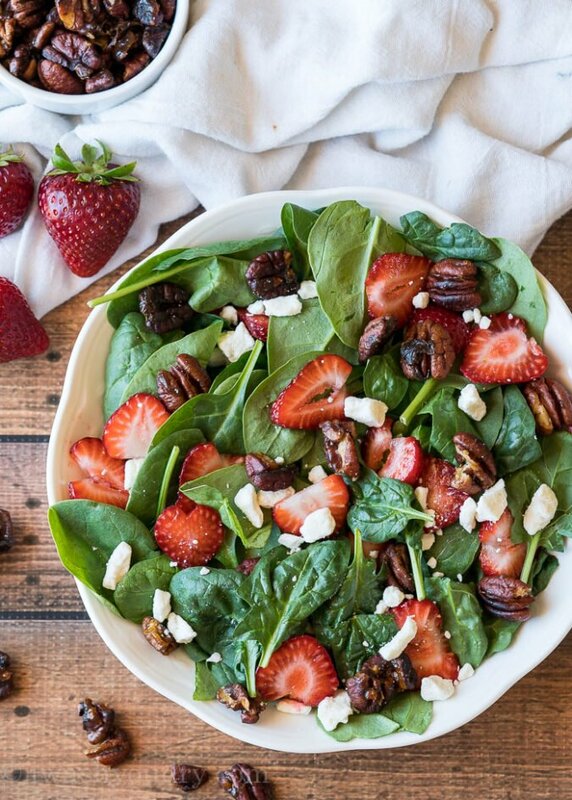 This Strawberry Spinach Salad with Candied Pecans is one of my favorites because it’s so simple to make and pairs perfectly with just about anything! Especially during grilling season! Oh how I adore strawberry season! Cheap, plump berries for all! 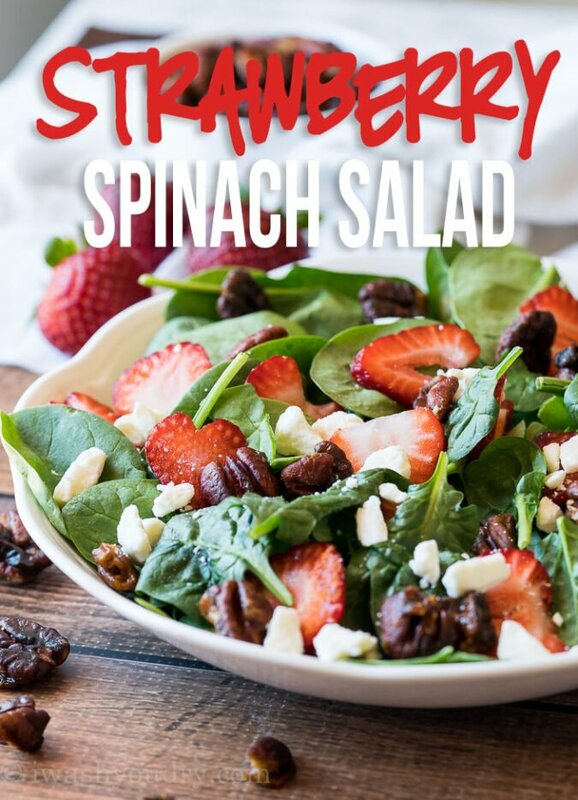 I love tossing fresh fruits into salads for a bright pop of color and sweet juicy flavor. I’ll bring this salad to pot lucks or over to a friend’s house for dinner and it ALWAYS receives rave reviews. I serve it with a balsamic vinaigrette, but I’m usually too pressed for time to make my own so I just use the bottled variety. If I’m making it to share with friends I’ll pour the dressing into a small mason jar to give the impression that I made the dressing too… is that cheating? Look, I love a good homemade dressing, but when you’re in a pinch the store bought stuff will suffice. I used soft goat cheese here, but a good feta cheese would work as well. Feta is more salty with a bit of a bite to it, where the goat cheese is more subtle in flavor with a creamy texture. Either one will work, so go with whatever tickles your taste buds! 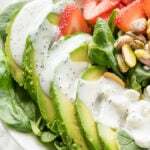 A thinly sliced purple onion would add great color and flavor to this salad as well! 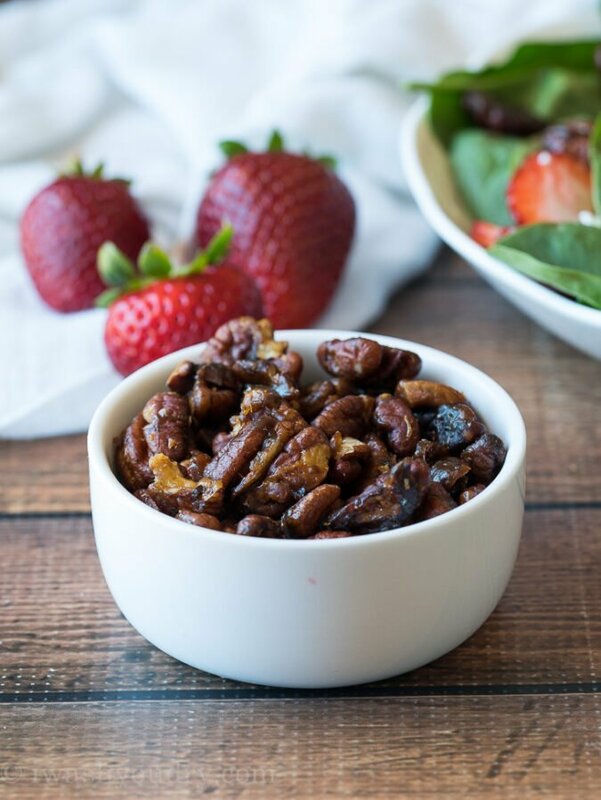 You can substitute the candied pecans for roasted pistachios, candied walnuts, or even sliced almonds if desired! 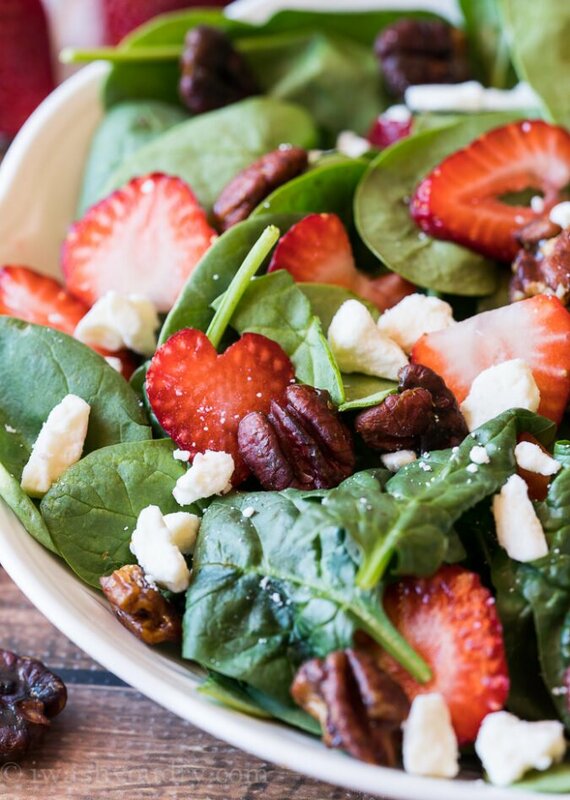 Strawberry Spinach Salad with Candied Pecans is a delicious salad that pairs perfectly with just about anything! Melt the butter in a small skillet over medium heat. Toss in the pecans and brown sugar, stirring to coat. Cook over medium heat until the sugar begins to caramelize (about 3 minutes). Spread out pecans on a wax paper lined baking sheet to cool. 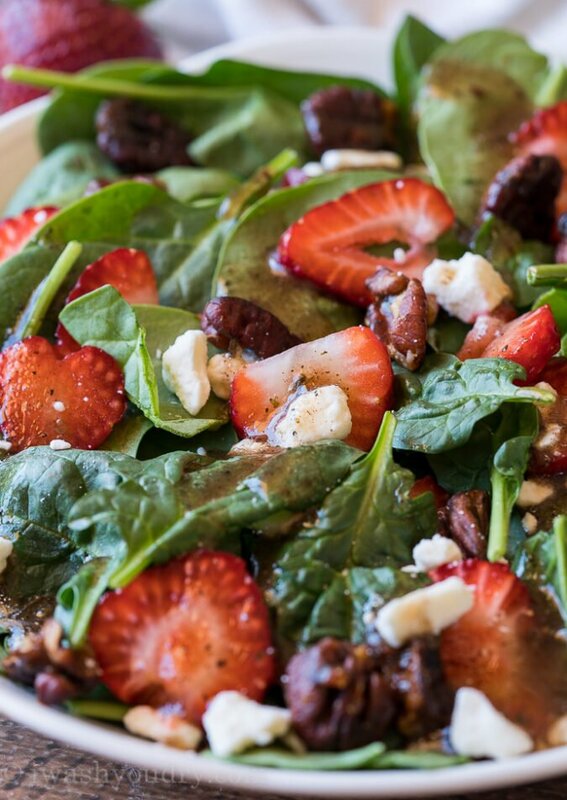 In your salad bowl layer the spinach leaves, strawberries, goat cheese and pecans. Don’t pour dressing on salad until ready to serve. Enjoy! 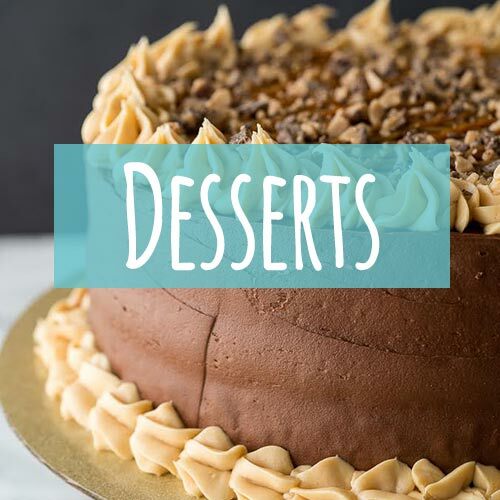 Great looking pecan recipe..love to add in my list.. This would be great with regular pecans added as well. Thanks! Love this salad. 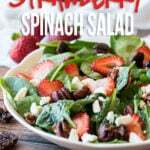 I usually use Brianna’s Strawberry or Blush Wine dressings with this salad. To me it says summer! Yum! Can anyone tell me how many people this recipe would serve – sounds awesome with the pecans and goat cheese!! 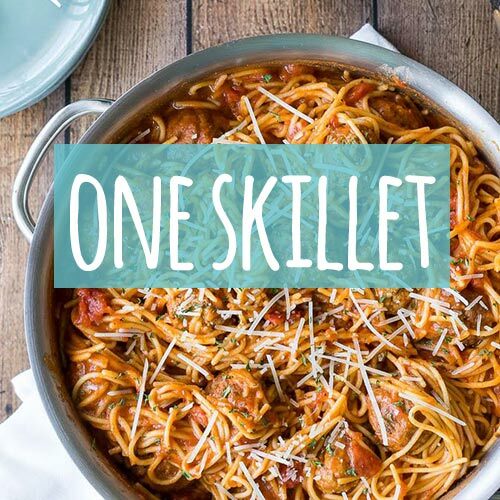 I made this for dinner tonight with orza pasta and baked porkchops. Hubby was skeptical at first but after he tasted it, he was hooked. We love it! I used a honey goat cheese and it was fantastic. Thanks! 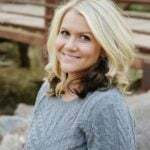 Just my $.02 about faking it: (like pouring store-bought dressing into your own bottle) it just makes other people feel pressured to be perfect. Be authentic and everyone else can relax because we’re all busy and need to find time savers! The only thing I do different , the dressing! 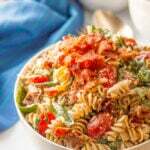 Get 1 tbspoon of strawberry jam , stick in microwave for few seconds just to melted, than add balsamic vinegar, mix well , add olive oil , salt by taste , and pour over the salad .Fabulous! Great idea you can apply theory to a lot of different favors. Great thinking! I too have been putting fruit and fruit and cheese and sometimes nuts in salad. I can’t get enough of it. And look how beautiful it is! However, the candied pecans are a little something special. Very very nice. No I don’t think bottled dressing is cheating. I always like homemade better, BUT there are alternatives. Sometimes time demands we use those alternatives, as you already know. The perfect summer salad— pinned! 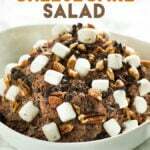 I’d fill my salad with way too many pecans, ha!! Love it! Been there. HA! Thanks Dorothy! So simple. When I coat the pecans I forgo the butter & just melt the sugar in the pan & toss in the nuts–just be careful you don’t burn them.